We, The People is series of Social and Political Life for classes 6 to 8. 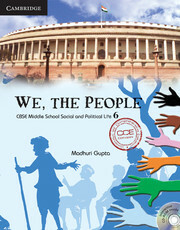 We, The People is a series in Social and Political Life for classes 6 to 8. It conforms to the curriculum specifications as delineated in the National Curriculum Framework (NCF 2005) prepared by NCERT. The exercises in the series are based on the Continuous and Comprehensive Evaluation scheme as introduced by the Central Board of Secondary Education. The series is also suitable for schools affiliated to state boards of education who are following the National Curriculum Framework. Learning Objectives state the topics to be covered before the start of every chapter. Do You Know provides additional information on the topic. Let's Recapitulate summarises the important points covered. HOTS questions empower the learners with critical thinking abilities. Look Up gives web links for further exploration of the topic. CCE based activities monitor the pace of learning and provide continuous feedback. In-text Formative Assessment Tasks gauge the learner's comprehension of the topics. Summative Assessment Tasks take an innovative graded approach by focusing on information, skills and strategies needed to pass the Class X board exam. Four Formative Assessment Tests and two Summative Assessment Tests divide the course content into two terms as regulated by CCE guidelines. In addition, the CD-ROM version of the student book is bundled with interactive CD-ROMs.